Fifteen people who were arrested in May, including Senate candidate Zak Ringelstein, had their charges dropped Thursday in an agreement with prosecutors. 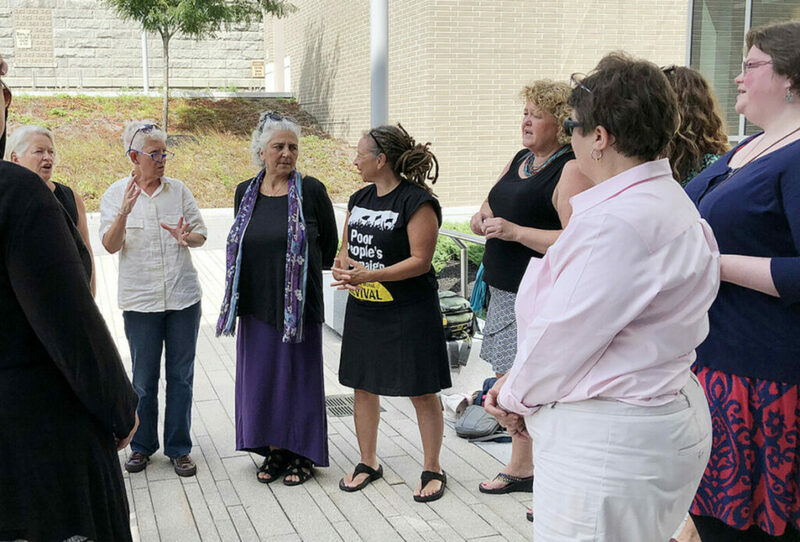 AUGUSTA — Criminal trespass charges against a group of protesters arrested last May while taking part in an anti-poverty demonstration at the Blaine House were dismissed Thursday. The group of 15 people, who were scheduled to go to trial this week, had their charges dismissed after they had either completed community service of made a donation to a nonprofit group. The protesters included several members of the clergy and Zackary E. Ringelstein, the Democratic candidate who unsuccessfully challenged independent U.S. Sen. Angus King for his seat last November. Some of the accused protesters already pleaded guilty to the charges against them, but 15 of them were set for a jury trial this week. That trial was canceled after all 15 remaining defendants reached an agreement with prosecutors. The charges were dismissed Thursday after all of the accused provided proof they had each either done 10 hours of community service or donated $100 to a nonprofit group in Kennebec County. Lawyers for the group members said their clients agreed to the resolution of the case in large part because, with a new administration in the Blaine House, one of their major goals of the demonstration — increasing access to health care by expanding Medicaid — has been accomplished. Gov. Janet Mills, fulfilling a campaign vow, signed an executive order soon after taking office expanding Medicaid to more than 70,000 Mainers. LePage opposed the expansion. The May 14 demonstration was part of the nationwide Poor People’s Campaign, with about 150 people at the protest on State House grounds, according to organizers, rallying to advocate for Medicaid expansion, more help for homeless people and other anti-poverty efforts. District Attorney Maeghan Maloney said the agreement was a good resolution to the case, which involved class E charges, the lowest level of charge. Attorney Tina Nadeau, whose clients in the case included the Rev. Carie Johnsen, minister of the Unitarian Universalist Community Church in Augusta, said she also believed her clients agreed to the deal instead of going to trial. She said prosecutors were initially reluctant to make the deal, instead seeking to have the protesters plead guilty initially with, through deferred disposition, the ability to have the charges dismissed if they later met agreed upon conditions. Logan Perkins, attorney for five protesters including Ringelstein, said she didn’t think any of the clients “felt particularly guilty” about their actions and were happy to resolve the case without a guilty plea by coming to a mutual agreement on a resolution. Several others among the May 14 arrestees — the numbers vary from the 18 reported in the news to 22 as calculated by the campaign coordinators — were convicted previously, but the majority remained united in their desire to go to trial, until the community service or donation agreement was reached.